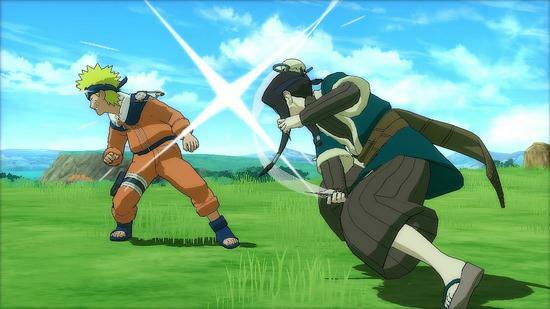 Naruto Shippuden: Ultimate Ninja Storm Generations 360 Review. Overall, not surprisingly there is a lot here for fans of the series, but there is also an excellent story driven fighting game for fans of the genre. Naruto is a popular Japanese Manga that focuses on the lead character, Naruto Uzumaki as he strives to become the Hokage. If all this sounds foreign to you, as it did to me before playing this game then do not rule this title out based on this. 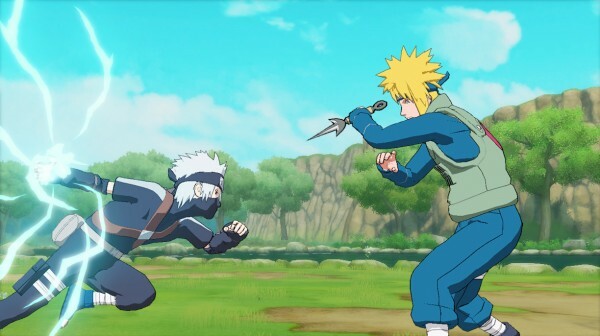 Naruto Shippuden is a fighting series that features arena style combat that is fast paced and features a strong narrative, as any fan of the manga will tell you. Fans of the series manga will likely buy this regardless of whether it scores well or not, but is there anything here for those new to the series. Naruto has a heavy narrative that is typically found in manga series’, with Naruto Uzumaki being the key protagonist and his story being the longest in the game. The story is very well done in this game, with the cut scenes being produced by the studio responsible for the show adaptations, Studio Pierrot. The game allows you to play through a number of characters stories and features over 70 characters overall. The game uses cut scenes at the beginning and end of each story with comic style transitions between each fight, these do a great job and explaining each fight and providing real motivation, to a standard that is generally unseen in the fighting genre. Prior to spending some with this title I had not watched much Naruto, but playing this really made me want to delve right into the manga series. The game looks stunning, keeping the feel of the series during the action. Everything looks just as it should, it looks almost like watching the show. There is really no surprise here, in the current generation of games developers have really been able to capture the look of cartoons in games. The arenas do look very basic, but I never felt like this detracted from the overall experience. It really does add a lot to the overall experience when the in game action looks very similar to the cut scenes, especially when it all looks this good. The only bad points about this title visually are the menus, they are trapped in a bit of a time warp, they look very much at home in Japanese games from a number of years ago. Also, the main menu is hideous, the screen is overly bright and I found it very cluttered. Although most will come for the story, they will stay for the game play, and fortunately this is another strong point for the game. The fighting is fast and strategic; it does have its flaws though. This is an arena fighter involving simple commands with the focus really what is happening on screen, not what the inputs are. For example, there is only one button to strike, despite this the fighting is surprisingly deep. Players are able to teleport away from their opponent when they are attacking and then attack them. This time there are only four teleports per player, they do recharge, this can lead to trying to trick your opponent into using a teleport so you can get the final combo. 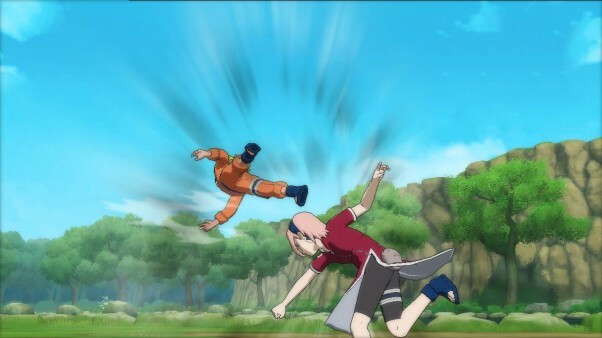 You also become more powerful when you charge your Jutsu. There are some negatives to the combat, these feel more like oversights. As a newcomer to series I had virtually no idea how to fight effectively or use any of the more advanced moves and quickly found myself struggling. To overcome this I had to study the combo list and command list, I would have found a tutorial of some sort incredibly useful and this would have saved a great deal of frustration early on. Fortunately, the fighting is simple enough that you can still learn this for yourself if you are new. 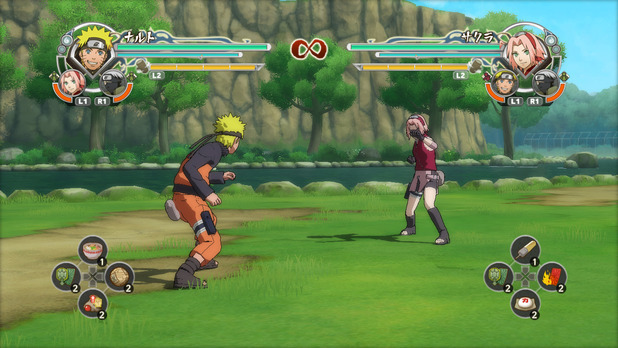 There are some balance issues with the game also, some characters are able to enter an “awakening mode”, this essentially makes them nearly impossible to beat, especially Naruto’s. They can only transform when their health gets down to a certain level, but still creates huge imbalances. The main method that the developers utilised to increase difficulty is to the opponents deal out more damage, this creates huge imbalances during the fights. The sound effects during fights are pretty much spot on, as is the voice work during the cut scenes. This all adds a huge amount of authenticity to the experience and with the voice acting being generally very good in the manga series it really does add a layer of quality to the final product and also a degree of respect for the fans of the series. As these fans are going to make up a large portion of the target audience. There is a lot to do here, the story missions will take a while to complete them all, and there is also a ranking system for those wanting to really challenge themselves. There are also free battles and online matches. For those looking for it there is heaps of play time here and a decent amount of value. The story missions will probably be enough value for true diehard fans. There are also collectibles within the game for the completionists out there. Overall, not surprisingly there is a lot here for fans of the series, but there is also an excellent story driven fighting game for fans of the genre. 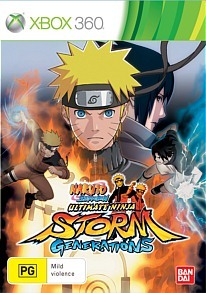 For those of you out there who have not experienced Naruto this may be a great way to introduce yourself to the universe and even if you don’t warm to the story there is still a deep arena fighter here that takes time to truly master all of the intricacies. A surprisingly complete experience that should appeal to all fans of the genre, and to those looking for something a little different to the typical fighting game.